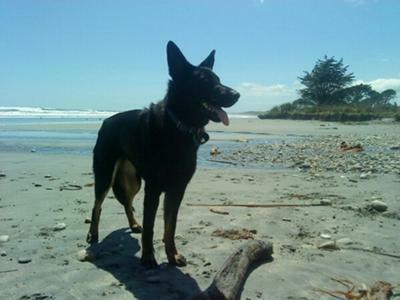 I have a 2 year old black purebred german shepherd dog and she is gorgeous!! She is so loyal to me and is always up for a walk, run, game of fetch or just a plain hug! she also enjoys going for drives in the car. Bella not only is a caring dog, she has made me laugh alot! If you dont have enough time for a german shepherd, i recommend that you dont get one, they crave so much attention. She also is always testing her boundaries, she is always wanting to be the pack leader and ya need to stay firm and let them know who is boss...constantly!! Bella (well all german shepherds) are known for recognising places etc. When i start driving to the beach, about 3 km from it she knows where she is going, which can get frustrating, especially if your not going to the beach, still a crack up tho.. If you want a dog that makes you feel safe then i recommend a german shepherd. Bella will never attack someone but if she ever see me getting attacked i know she will jump in..
Last year someone tried breaking into my bedroom in the middle of the night. If it wasnt for bella barking and carrying on, i dont know what would of happened!! At the end of the day, bella is amazing and wouldnt trade her in for anything!! Plus, ya always know ya can count on her to be happy when she sees me no matter what :)!! If you plan on getting a german shepherd - GOOD LUCK and ya wont regret it :)!! !